Market Manila - Hanger Steak with Caramelized Onions - Beef/Lamb, etc. Feeling low in iron and zinc? 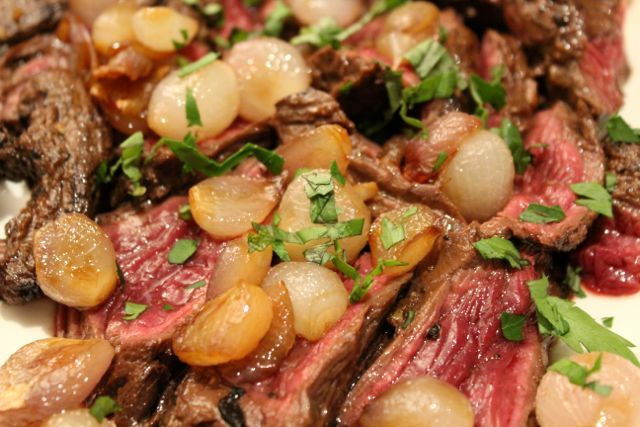 How about some marinated steak that’s been seared to a “blue-rare” then sliced and served with caramelized shallots? Trim the hanger steak to remove the “center muscle” and other chewy parts (you’ll know what they are when you see them) and add some chopped garlic, dijon mustard, worcestershire sauce, olive oil, red wine vinegar, a little kikkoman, salt and pepper and let this sit, covered for say 30-40 minutes. Peel several native onions (small shallots) and keep them whole, then heat up a heavy pan, add some olive oil and brown the peeled shallots and toss them frequently. Season with salt and a bit of sugar to help the caramelization along. Add a few drops of red wine vinegar and remove the onions and set them aside. Put the pan back on high heat, add a bit more olive oil if necessary, and when the oil is smoking hot, sear the steak and cook it for a few minutes before flipping it over. I was in a bit of a hurry, and cooked this steak perhaps 2-3 minutes short of rare. Let the steak rest for a few minutes and slice and garnish with the caramelized shallots and sprinkle with some chopped flat leaf parsley. Serve immediately. This was a super easy and delicious steak dish. It was a bit on the chewy side, but really flavorful and satisfying. A few of the largest pieces of steak were just a bit too rare and we returned them to the pan to sear the cut sides for a couple more minutes and they were served for seconds… Yum. 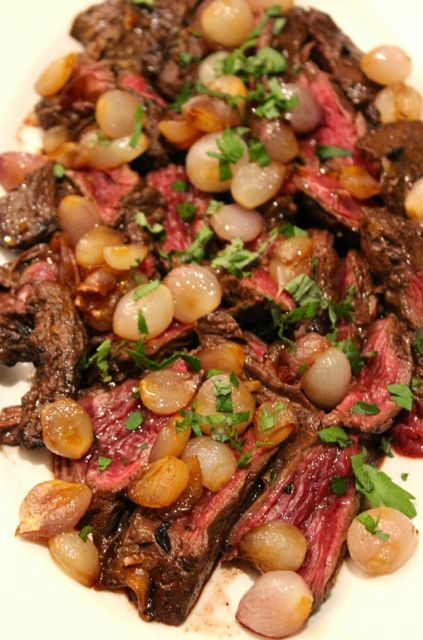 I have been wanting to cook hanger steak for my family (from all the Food network shows I watch) so I keep an eye out for it in supermarkets (I live in the south so it’s South Supermarket, Shopwise, Rustan’s or Metro for me). The beef section does not seem to have it unless it’s there and both the meat person and I don’t know it. Can I please find out if it is called another name or what is its Filipino equivalent? Thanks.